NASA's New Horizons mission team on Monday unraveled mysteries of the Kuiper Belt object (KBO) nicknamed Ultima Thule, the most distant object ever explored by mankind, Xinhua reported. New Horizons performed the farthest flyby in history at 12:33 a.m. EST (0533 GMT) on New Year's Day, as it approached Ultima Thule within 2,200 miles (about 3,540 km) of the surface at a velocity of 31,500 miles (about 50,694 km) per hour. Analyzing the data New Horizons has been sending home since the flyby, mission scientists are learning more about the formation, geology and composition of this ancient relic of solar system formation, said a NASA release. Ultima Thule is the first unquestionably primordial contact binary ever explored, said the mission team. Approach pictures of Ultima Thule hinted at a strange, snowman-like shape for the binary, but further analysis of images taken near closest approach uncovered the object's unusual shape. 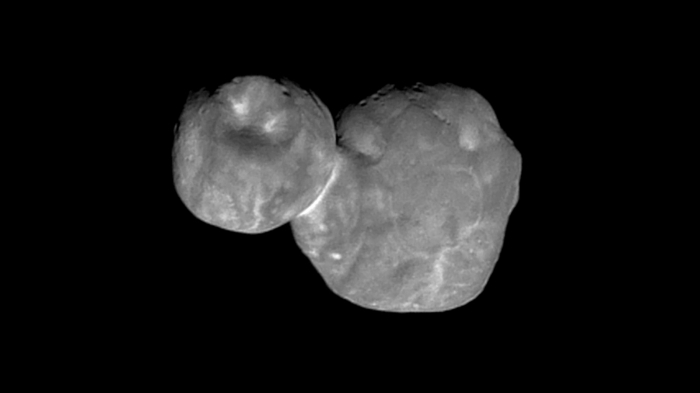 Ultima Thule consists of a large and flat lobe (nicknamed "Ultima") connected to a smaller and rounder lobe (nicknamed "Thule"). "We've never seen anything like this anywhere in the solar system," said New Horizons Principal Investigator Alan Stern. "It is sending the planetary science community back to the drawing board to understand how planetesimals - the building blocks of the planets - form." Scientists believe Ultima Thule's two lobes once orbited each other, like many so-called binary worlds in the Kuiper Belt, until something brought them together in a "gentle" merger. The "neck" connecting Ultima and Thule is bent, and could indicate shearing as the lobes combined, said Kirby Runyon, a New Horizons science team member. In terms of color and composition, Ultima Thule is very red - redder even than Pluto, which New Horizons flew past on the inner edge of the Kuiper Belt in 2015, and about the same color as many other so-called "cold classical" KBOs, said the team. New Horizons scientists have also seen evidence for methanol, water ice and organic molecules on the surface. Currently the New Horizons spacecraft is 4.1 billion miles (6.6 billion kilometers) from Earth, operating normally and speeding deeper into the Kuiper Belt at nearly 33,000 miles (53,000 kilometers) per hour.